My Mickey House is our wonderful vacation town home that we would love for you to enjoy as much as we do! We would like to invite you and your family to come create magical memories to last a lifetime in our newly/updated 3 Bedroom/ 3 Bath Town home. Located in the exclusive, 24-hour secured/gated and highly sought after 5 Star Windsor Hills Resort area. Just picture yourself relaxing in the Florida sun, near the pool with a bite to eat and a nice cocktail !! 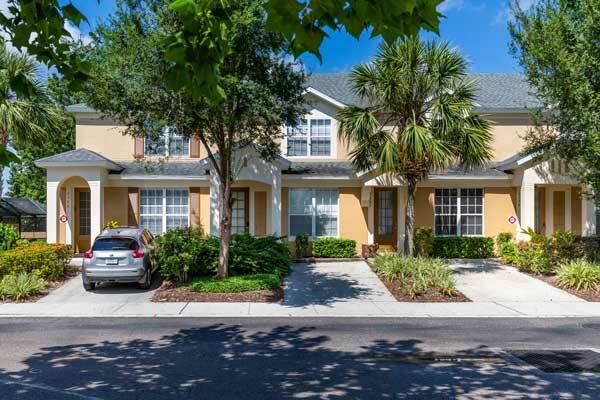 Our private community is only 5 minutes from Walt Disney World and 20 minutes from Sea World and Universal Studios. We are conveniently located to endless stores, outlet malls and restaurants. Rent with us during your next trip and make one of our homes your home. Our goal is to provide you with everything you need to make your vacation dreams come true. Our bright and airy Living/Dining Room opens out to your own private splash pool which overlooks a great open area with no rear neighbors. The Kitchen is fully equipped with everything you need to make a nice breakfast, a family meal or a simple snack. Come back from the parks for lunch and a dip in the pool. You'll be refreshed, ready to enjoy the rest of the day and magical fireworks when you return to the park. 1-Queen Sized Bedroom and Sleeper sofa, conveniently located on the first floor. All Bedrooms have their own full Bathrooms, Walk-in closets, TV's and DVD players and Ceiling Fans. Our home includes a Washer & Dryer, Iron & Board, Linens, Towels and Hair Dryers, so pack light. Have little ones? We offer you a free Pack & Play Sleeper, High Chair, Stroller, Child Safety Gate, PlayStation 2 and Child Safe Pool Fence. Free Cable and WiFi. Complete use of all Resort Amenities: Windsor Hills Resort Huge Lagoon-Style Pool with New Fantastic Dueling Water Slides and Kiddie Splash Play Area, Castle Playground, Video Arcade/ Game Room, Basketball and Tennis Courts, Ping Pong and Pool Tables,, 40 Seat Movie Theater, Hot Tub, Fitness Center, and Marketplace Grill and Sundry Shop. Windsor Hills is great for Golfers, with several championship and executive courses within 3 miles. Your dream vacation awaits!